Just started learning some Substance Designer and I'm really loving it. It's technical enough to get my left brain satisfied, but then the right kicks in and the art happens for a great synergy. Just messin' around with Keyshot and ZBrush. Wanted to practice with ZModeler Brush and ended up making some textures in Keyshot. I made the Foot of Arkus for Skylanders Superchargers! Guess what... I made a prop that was used in the new Skylanders Superchargers game. It was used in a cinematic! 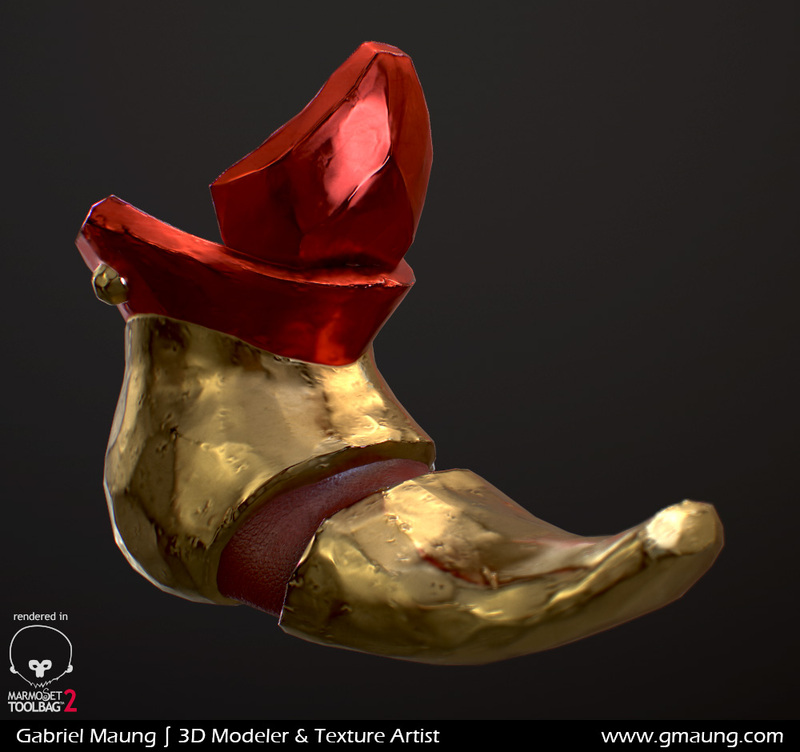 Here's what it looks like in game and rendered in Marmoset. If you want to see it in the actual cutscene, check out this video on YouTube. Almost got the Robotoball in there too, but I think it was cut out because of the pacing of the scene. Or maybe it just didn't read well. Potion Bottle for a scene I'm building. This one is from Keyshot, but I also have some renders from Marmoset that make it look like it has dichroic glass, or at the very least fumed glass. I'm torn between the first version (A) and the last version (F), mainly because the far right one shows more of the liquid inside. Finished up the Colt .45 model I've been working on. Super happy with the results of the normals and the texture came out really well I think. I watched the Digital Tutors video on this, but deviated at the end to make a more precise version. I'll be texturing this in Mari later as well to see how the program compares to using dDo. Check it out in my Props section. Finally had some time to make a stone floor. I created a base mesh in 3DS max using Stone Placement Tool script. Then I brought that mesh into ZBrush and started to sculpt away the hard edges. Then I decimated the mesh and brought it back into max for unwrapping. Various maps were then baked out using xNormal and then I composited them in Photoshop. Could use some more tweaking before I'll consider this done, but this render turned out pretty good so here's a preview. 2k textures rendered in 3DS Max. 3,292 tris and is double sided; as in top and bottom are unique for added modularity. I wanted to expand my knowledge and brush up on my After Effects skills, so I decided to make an animated UI for one of the props in my Sci-Fi Hallway. Learned a ton about expressions and found this really neat preset called DKOscillator. Super helpful for making UI elements repeat without having to keyframe every little movement. Not 100% happy with the way it turned out, but I think the basic idea is there and if this were to become a functional UI it would be much better. For now it is just a looping animation. The great thing is that I managed to get it into UE4 using a flipbook texture sheet; well 4 to be exact. Like what I'm doing? Help keep it going and support me and my family. Copyright © 2019, C.Gabriel Maung. All rights reserved.